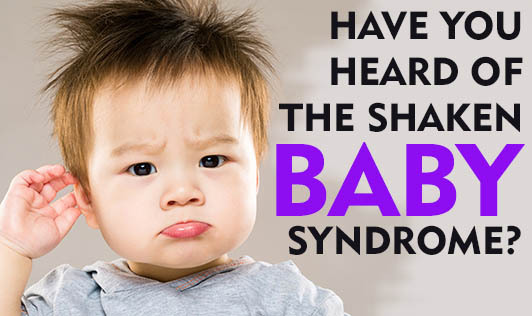 Have You Heard Of The Shaken Baby Syndrome? Shaken baby syndrome (SBS) is a serious type of brain injury that occurs when someone shakes a baby severely, causing the baby's brain to move inside the skull. Shaken baby injuries usually occur in children younger than 2 years of age, but may be seen in children up to the age of 5. It is almost a result of child abuse, often perpetrated by a parent or caregiver who shakes an infant angrily in response to persistent crying. This violent movement pitches the infant's brain back and forth within the skull, sometimes rupturing blood vessels and nerves throughout the brain and tearing the brain tissue. Symptoms: seizures, extreme irritability or other changes in behavior, lethargy, sleepiness, not smiling, loss of consciousness, loss of vision, no breathing, poor feeding, lack of appetite and vomiting. This condition is difficult to diagnose as there may not be any physical signs of injury, such as bruising, bleeding, or swelling. Infants with injuries of shaken baby syndrome require emergency care, including respiratory support and surgery. Additional treatments may be required as well, including obtaining ophthalmologic and neurological evaluations. • Never shake a baby or child in play or in anger. • Do not hold your baby during an argument. • If you find yourself becoming annoyed or angry with your baby, put him in the crib and leave the room. Try to calm down. Call someone for support. • Call a friend or relative to come and stay with the child if you feel out of control. • Do not ignore the signs if you suspect child abuse in your home or in the home of someone you know. It requires medical emergency. Never ignore!